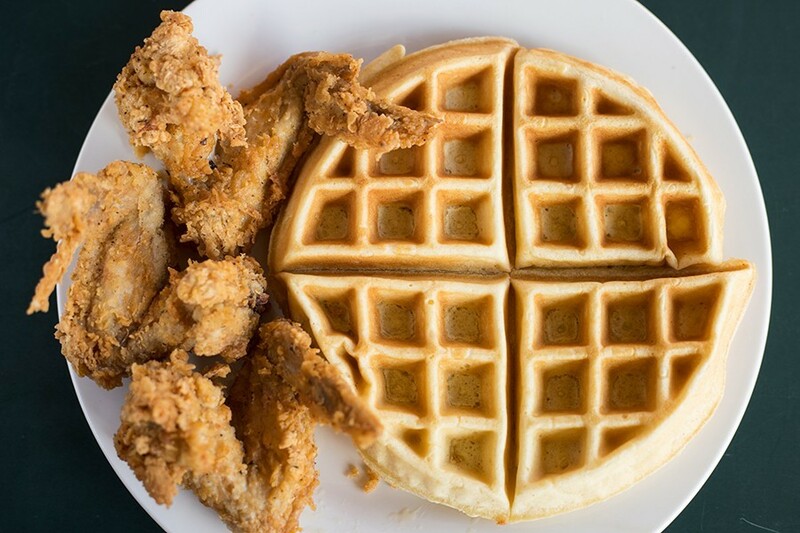 An offering of chicken and waffles pairs three chicken wings with a Belgian waffle. 1435 Salisbury Street, 314-833-4335. Mon.-Sat. 9 a.m.-2 p.m.; Sun. 12:30-5 p.m.
Maggie Hourd-Bryant is fiercely protective of her recipe for smothered potatoes. It's not that she won't spill the tea to customers — she doesn't even let those helping her out in the kitchen know the details, insisting that she prepare them herself. When you press her on this, all you'll get is a simple, "They're my grandmother's." Her smile is warm, but she shuts you down with the same quiet firmness of "the look" your mother gives when you're starting to push it. You don't even have to take a bite of the smothered potatoes to understand why she is so protective. This is the sort of dish that reveals its greatness on sight, not because of some elegant plating or fancy adornment, but because you just know. The potatoes are probably cut into large rustic cubes, but you can't really tell because they have been cooked to the point of breaking down, suspended between solid hunks and mashed. Slicked with cooking oil, the potatoes caramelize around the edges, as if they've been pan-fried to the point of becoming golden and then scraped off the bottom of the skillet. Tiny slivers of white onions are softened in the oil so they're reminiscent of the ones you get on a White Castle slider. Salt and black pepper season what seems like a warm breakfast version of potato salad. It's such a masterpiece, you'll immediately understand why Hourd-Bryant guards it as closely as a state secret. The smothered potatoes may come from Hourd-Bryant's grandmother, but the inspiration for her seven-month-old restaurant, the River Lillie, is her mother, Lillie. Raised three miles from the Arkansas border in Missouri's bootheel, Hourd-Bryant grew up on her mom's Southern-inflected cooking and learned her recipes and techniques at an early age. Maggie Hourd-Bryant named the restaurant for her mother, Lillie. Though she loved cooking, she did not think of it as a career, and instead chose to study social work. Her academic pursuits led her to a PhD program at Washington University in St. Louis, and she comfortably settled in a neighborhood near the campus. 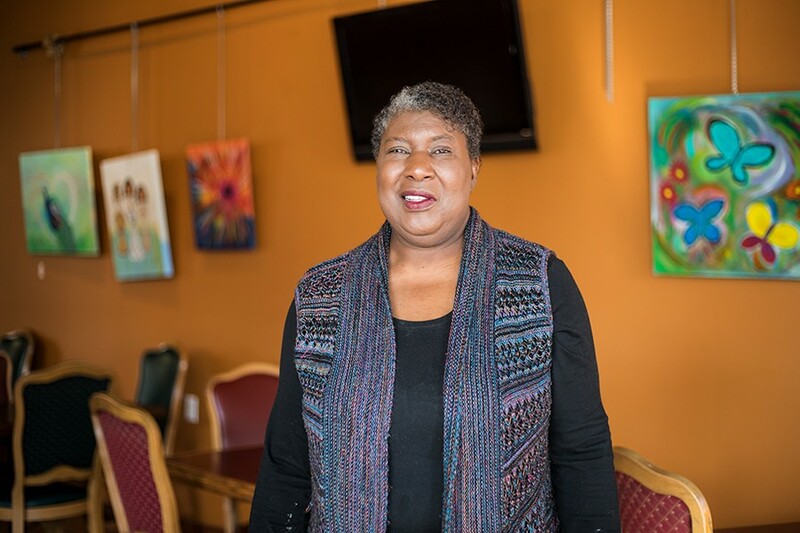 Though proximity to school was a plus, Hourd-Bryant grew weary of the high rent and eventually purchased a home in north city's Fairgrounds neighborhood, where she immediately felt at home. Hourd-Bryant worked as a non-profit leader, a grants administrator for the city of St. Louis and a community mentor before being tapped to take a teaching position at Vatterott. But not long after the job offer, she was diagnosed with Bell's palsy, which left her temporarily unable to talk. Unable to teach, Hourd-Bryant had to recalibrate, seeing what she originally considered a setback as an opportunity. She had always loved cooking, after all. Perhaps this was the chance she had been looking for to combine her passion for food with her mission of serving the community. 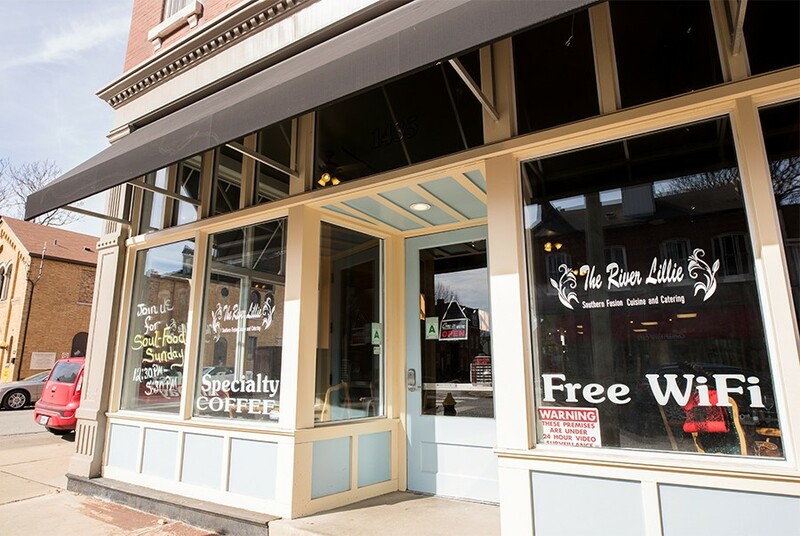 After several months of eyeing the newly renovated storefront at the corner of Salisbury Street and Blair Avenue in the Hyde Park neighborhood, Hourd-Bryant decided to take the leap. She signed a lease and got to work putting her touches on the space, opening the charming daytime spot last June. Wooden tables and vintage-style chairs, upholstered in hunter green and burgundy, provide seating throughout the restaurant's two dining rooms. Soaring ceilings make the space feel lofty, but the restaurant's earthy color palate gives the River Lillie a cozy feel. Paintings by local artists hang from the walls, and antique-style serving dishes make you feel like you are having lunch in someone's home — and they've gotten out the good china. 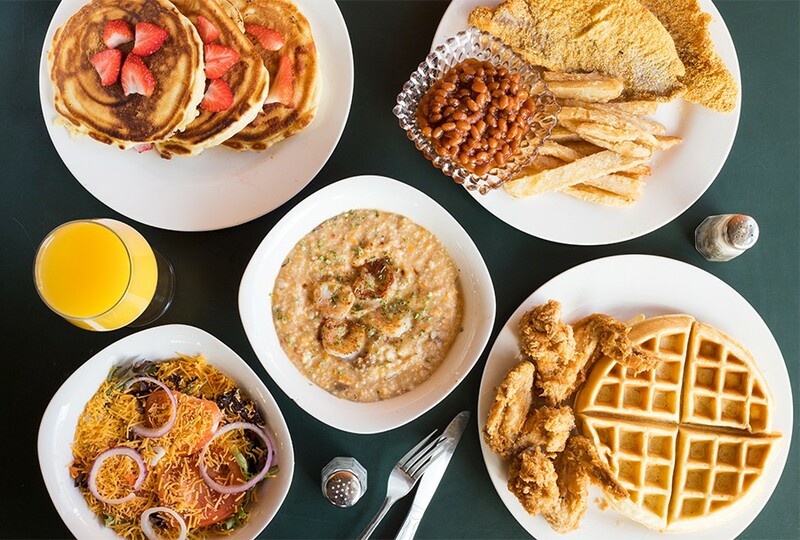 Southern-inflected favorites at the River Lillie include strawberry pancakes, catfish fillets, chicken and waffles and shrimp and grits. That homey feeling is also apparent in the River Lillie's Southern-inflected food, which is the epitome of daytime comfort. For breakfast, Hourd-Bryant sticks to the classics, and she does them exceptionally well. Fluffy biscuits are smothered in peppery, sausage-laden gravy that is rich without being overly thick. Those same biscuits serve as the base for a delightful breakfast sandwich. 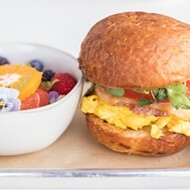 Scrambled eggs, cooked so that they are still creamy, are piled onto the biscuit with molten American cheese and bacon. At less than $4, including smothered potatoes and a drink, it's one of the best breakfast deals around. The River Lillie's pancakes are perfection of the form. Slightly sweet and fluffy, the hotcakes crisp up around the edges like a crepe. I thought they needed nothing but warm syrup and butter, but then I tried the blueberry version and was utterly dazzled. These are unquestionably some of the best pancakes in town thanks to the innumerable blueberries folded into the batter, giving each bite a juicy pop of warm fruit. They're breathtaking. 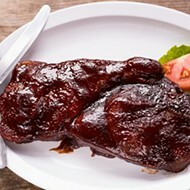 At lunch, Hourd-Bryant's Southern style really comes out on dishes such as fried chicken wings, which are coated in a delicate, well-seasoned breading and fried to a gorgeous golden brown. The crust is flaky, crisp and not at all greasy, a lovely contrast to the succulent, well-cooked meat. For an accompaniment, I chose fried corn, a mouthwatering concoction of off-the-cob kernels caramelized in butter. It's so creamy, you could spread your bread with it. Shrimp and cheesy grits, shown here with a chef’s salad, demonstrate Hourd-Bryant’s skill at Southern cooking. Shrimp and grits, one of Hourd-Bryant's specialties, shows off her cooking prowess. 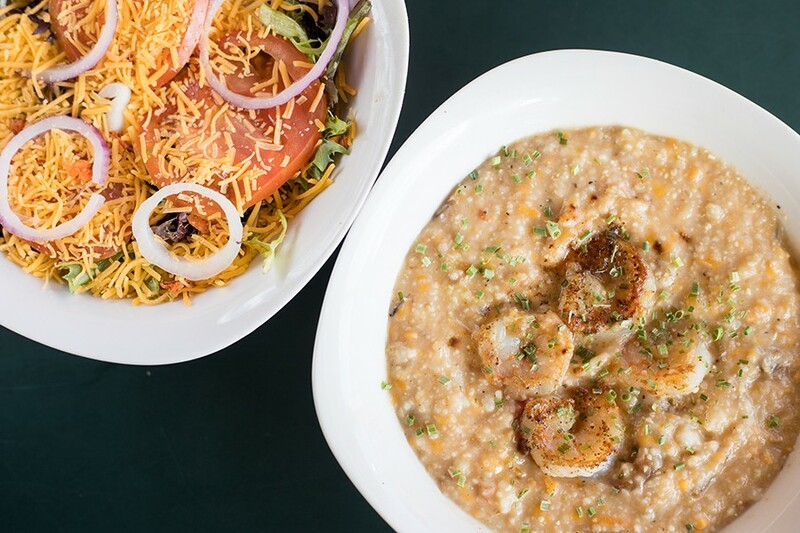 The grits are fortified with three different cheeses, giving them a luxurious, velvety texture that is broken up with hunks of red and green bell peppers and onions. 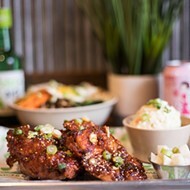 Whole pieces of grilled shrimp sit atop the concoction, but Hourd-Bryant also cuts up smaller bites of the shellfish and folds them into the grits, underscoring the dish's sweet seafood flavor. An accompanying slice of toast appeared to be an afterthought, but its shockingly thick coating of caramelized garlic butter made it transcendent. Next time, I'll ask for an extra piece. The River Lillie's burger is a mammoth patty of ground beef, simply seasoned and served on a griddled bun. Usually, I prefer thick burgers like this to be cooked to temperature, but that was not offered. The meat came out around a medium-well, but it was juicy and well-seasoned, evoking the homestyle, pan-fried burgers my mom used to make. Typically, I limit my review to what I experienced in a restaurant during the course of my visits. In this case, though, it's only fair to mention what I didn't get to experience. On a recent Sunday, I tried to eat at the restaurant's weekly soul-food event, only to be greeted by a distraught Hourd-Bryant. The restaurant had to shut down for the day, she said, because the hood system was broken. I can't begrudge her for having an equipment malfunction; it's an unfortunate situation that can happen to any business. But the River Lillie also came up short on a few other visits. In one, the kitchen was out of a few items even though the doors had only recently opened for the day; in a subsequent trip, it was out of the entire appetizer portion of the menu. Long ticket times also kept the pace a bit too leisurely. Our server was gracious and apologetic, explaining that Hourd-Bryant was a one-woman show in the kitchen because of staffing issues, but a similar problem plagued the restaurant when I previously visited in December. I think Hourd-Bryant is in a tough spot. 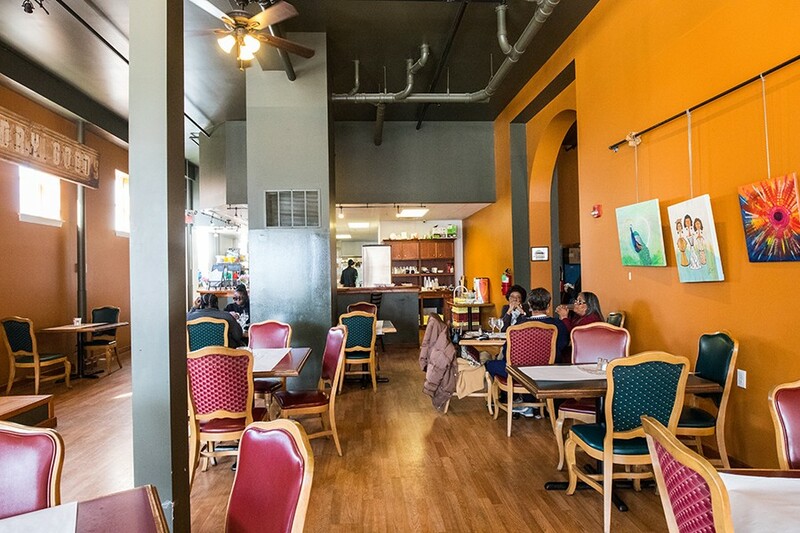 As a new restaurateur, she's working tirelessly to achieve her vision in a part of town that has been all but written off by the rest of the metro area. 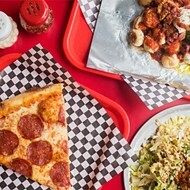 It's difficult to cultivate a customer base even in a thriving business district; in a distressed neighborhood, that uphill battle is even steeper. And without a steady thrum of customers, everything from staffing to food purchasing becomes infinitely more complicated. Maybe at a lesser restaurant, these problems would give me pause, but I am not going to let them stop me from going back to the River Lillie. In fact, they're the reason I am going to be one of its most ardent supporters. There is no question Hourd-Bryant has the cooking skills and inclination to hospitality that are the foundations of a good restaurant. Once enough people realize that, I suspect, she'll be in good shape. In the meantime, what's the worst that can happen — I might be left with only her pancakes and her grandmother's potatoes? I'll be there, and ready to eat. 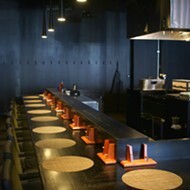 The restaurant is located in Hyde Park.